Electronics Costs > How Much Does a Samsung Galaxy Battery Cost? How Much Does a Samsung Galaxy Battery Cost? 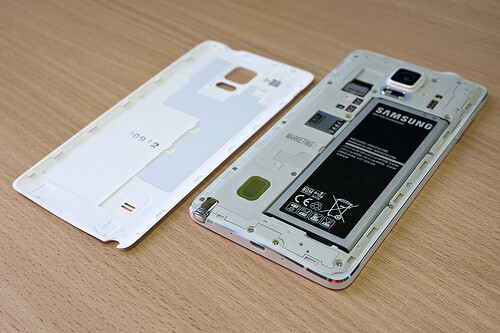 Like all batteries, the Samsung Galaxy battery can wear out over time. If you notice that your battery life is wearing out much more quickly than it used to or that it will simply not hold a charge, it may be time for a new battery. How much does a Samsung Galaxy battery replacement cost? The cost of a Samsung Galaxy battery will greatly depend on the exact Galaxy model you have, the repair shop you use and which type of battery you plan on replacing it with. The older versions, such as the S2 to the S4, can cost $8 to $15 for just the battery, whereas the more complex models, such as the S5 to S8, can cost $30 to $80+ if you were to hire a professional cell phone repair service. Jet City Device Repair, an online cell phone repair service we had found, charged $69 for a Samsung S7 battery replacement, for example. This included all necessary parts, labor and an industry-leading lifetime guarantee. If you were to use an online repair service, shipping fees may apply; however, this fee is often tied into the repair estimate. If not, it won’t be more than $10 at most. If you have only owned the phone for less than a year, then there’s a good chance it’s still under warranty. Check with Samsung by following this link to see if your phone is still under warranty. If so, you may be able to have the repairs covered 100 percent. The S6 and S7 are said to be the hardest batteries to replace; however, if you have an older version, you may be able to replace the battery on your own by following simple how-to guides online and purchasing the batteries at either Walmart or Amazon.com.